Except that suddenly there are exactly 7,929,562,377 unread items when I log in to any app anywhere at any time. And that sh*t stresses me out. Because if it's not bad enough that I've got anxiety from the insomnia that's induced by the to-do list that doesn't stop running through my head on any given night, now that list is ever-expanding thanks to all that potential content: All the geeky goodness, nerdy nuggets and other general learn-y type info that I collect on my endless rounds of the Internet. I mean, let's be honest. That's what I'm really doing with it: collecting it. I'm certainly not going through it all. I don't have enough hours in a day to read, hear or watch all the things I think are fascinating on the Internet. I mean, I barely have enough time to filter and collect it in the first place. Which is why one day last week, I finally gave myself permission to reset all of my Feedly feeds to zero. Now, let's be clear: I didn't delete any of them. ARE YOU KIDDING?! Do you know how many hours I've spent curating all that goodness? OMG, don't even joke about that! No, no. I marked them all read. Let me be clear: I set those counters back to zero and I hadn't even read them all! And you know what happened? When I logged into Feedly a few hours later, there were new articles. Hundreds of them published since I had last opened the app. New amazing thoughts I might learn from, might get inspired from, might love, might hate. And I realized how long it's been since I allowed myself to clear a slate like that. That I always had thousands of unread items I would never get to but held on to for... what, exactly? To add to my unyielding stress? Because that just makes me some masochistic idiot, doesn't it? Did I ever think I was really going to get to that massive backlog? Did I think Mother Nature was just going to bestow me (and only me) an extra few dozen hours each day when I might actually make it through those? No, of course not. *Note: I originally wrote that as "necessarily be worse off" - stupid FOMO. **I think. Did you read it? Was it good? Ugh. 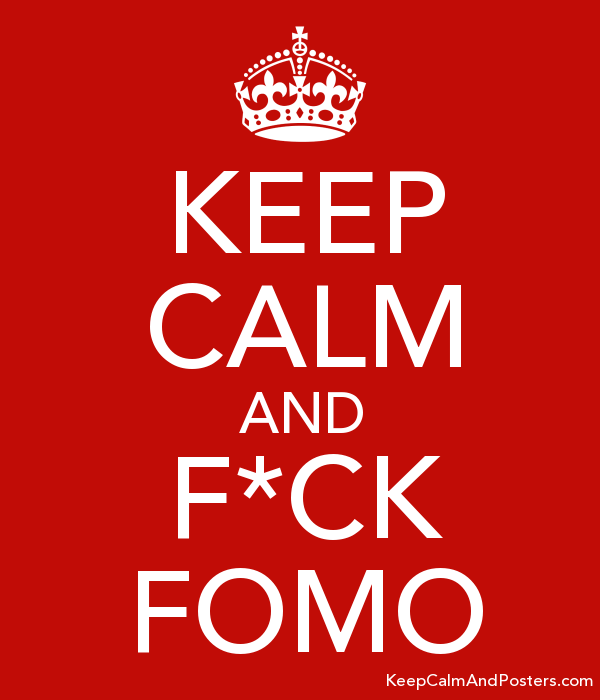 Stupid FOMO.